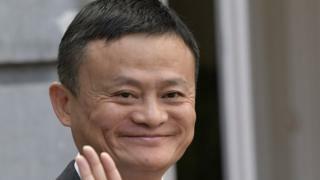 The co-founder of e-commerce giant Alibaba and one of China's best-known businessmen, Jack Ma, is stepping down. Alibaba said chief executive Daniel Zhang would succeed Mr Ma as chairman of the board in a year's time. He will leave on his 55th birthday on 10 September, 2019 - making him the first founder among a generation of prominent Chinese internet entrepreneurs to step down from his company. He bought his first computer at the age of 33 and was surprised when no Chinese beers turned up in his first online search for "beer". Image caption Jack Ma says he wants to return to education because this is what he 'loves to do'. Image caption Jack Ma pledged to help create a million US jobs after a meeting with then President-elect Donald Trump. In January last year, Mr Ma said he had had a "great meeting" in New York with then US President-elect, Donald Trump. At the time, Mr Trump hailed Jack Ma as a "great, great entrepreneur, one of the best in the world", who loves both the US and China. In 2017, Mr Ma turned the firm's anniversary celebrations into a "Thriller" event, with a performance inspired by Michael Jackson.